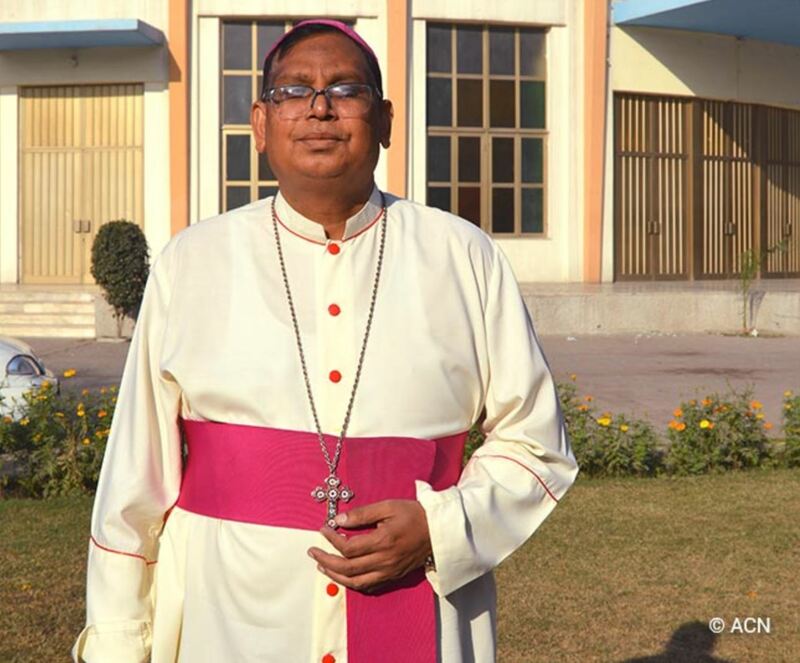 Archbishop Joseph Arshad of Islamabad-Rawalpindi is also the president of the Episcopal Conference of Pakistan. But his extensive responsibilities do not prevent him from being at the same time close to the poorest and most needy. He was interviewed by the international Catholic pastoral charity and pontifical foundation Aid to the Church in Need (ACN International) during a recent visit to the cathedral of Saint Peter and Saint Paul in Faisalabad. The recent high-profile case of Asia Bibi, the Christian woman accused of blasphemy and held for almost 8 years on death row until her acquittal just a few weeks ago, underlines the reason why the Catholic Church is so insistent on the need for interreligious dialogue and working for peace in a country torn by the scourges of extremism, corruption and terrorist violence. What is the present situation of the country, following the election of a new government and a new Prime Minister last August? The new Prime Minister Imran Khan is attempting to tackle a number of extremely serious problems in the country, including unemployment, especially among young people, corruption and rapid population growth. Pakistan already has a population of over 200 million inhabitants. Khan’s election slogan was “Let us eliminate corruption”. It was a message that chimed well with the population, who have seen how the economic resources of the country and the money intended for education and healthcare have been siphoned off. We believe that it could be a good opportunity to move forward and improve the lives of the people. What is the present situation of the Church in Pakistan? Ninty-five percent of the population are Muslims, and the remainder belong to various minorities, including Christians, Hindus, Sikhs and Parsees. Catholics number approximately 1.5 million, and Christians, including the many different Protestant denominations, total some 6 million people, or around 2% of the total. The Christians represent a particularly impoverished section of the community, many of them find only very precarious forms of employment, often in conditions of semi-slavery. The key for us is education so that we can improve the lives of the people and demonstrate that Christians are also part of society, equal in dignity and able to engage in skilled work. Theoretically, under the law, our community is entitled to a representative quota of 5 percent in the public institutions, but sometimes we do not succeed in occupying all these positions of responsibility, owing to the lack of people with the necessary qualifications. How would you define the life of faith of the Christians in Pakistan? Our people have a very simple but very strong faith. Despite the problems of access to education and the lack of opportunities, the people are faithful to the Gospel, and our churches are full. 90 percent of Catholic Christians attend Mass every Sunday, and many also during the week. I should also add that many people simply cannot attend Mass every Sunday owing to the lack of churches and of priests to minister to them. What can you tell us about the case of Asia Bibi? We in the Catholic Church respect the laws of our country and we respect the justice system. The Supreme Court in Islamabad has already given its verdict. They are the highest legal authority in the land and we have to respect the decision of the Supreme Court. Are Christians suffering the consequences of the extremism on the part of certain Islamist groups? Yes, most certainly. We have suffered attacks on our churches, and Christians also feel threatened by the blasphemy laws. These laws are frequently used for personal vendettas, in order to falsely accuse other people. But in reality, there need not be any problems if the local authorities would deal promptly with such cases. This is why interreligious dialogue is key to working together with the mullahs, the Islamic leaders, to check such campaigns of false accusations and help to calm down the more extremist elements. If we do not succeed in responding quickly enough where such accusations have been made, then people sometimes take the law into their own hands and end up murdering those who have been accused. I know a number of such cases because I am also the head of the bishops’ Justice and Peace Commission. What is the relationship between the Catholic Church and the other religions in the country? In the Pakistani context, interfaith dialogue is very important. The Catholic Church is leading the way in this respect. We are striving to find areas where we can work together – Muslims, Christians, Hindus, Sikhs, Parsees and other minority religions. Our experience is that when we share our lives, there is a better understanding between us. It is a slow process, and I believe that we need more work between individuals as well. Our aim is to bring about peace and counter extremism. Do you have a final word for the benefactors of ACN? I would like to express my gratitude to all the benefactors who are helping our community. The Catholic dioceses in Pakistan have to work very hard to raise the money to keep functioning. We have few resources of our own so that with your help and solidarity we are able to support some of the poorest in society. We don’t get aid from any other individuals or from any other institutions in Pakistan.